Task 1.2 Fitts and Posner suggest that this progression from novice to expert can be modelled using information processing concepts. Their model, which shows the three phase of skill learning helps coaches to analyse what stage of learning their athletes are at and structure practise accordingly. Fitts and Posner's model identifies three phases or stages of learning. They are Cognitive (early) phase, Associative (intermediate) phase and Autonomous (final) phase. Cognitive (early) phase The learner tries to get to grips with the nature of the activity that is being learned. Demonstrations are important, as this will give visual aid to the learner of what to do as well as verbal explanation, which tend to highlight the important cues. Problem solving also seems to work in the prepractise stage. Then after a demonstration the learner tries to remember or memorise the sequences of movements and also it helps to verbalise these, for example the breaststroke leg kick is a good example bend, kick and together another example is of a person juggling, practise and memorise the movements needed for a two ball juggle. ...read more. Autonomous (final) phase. 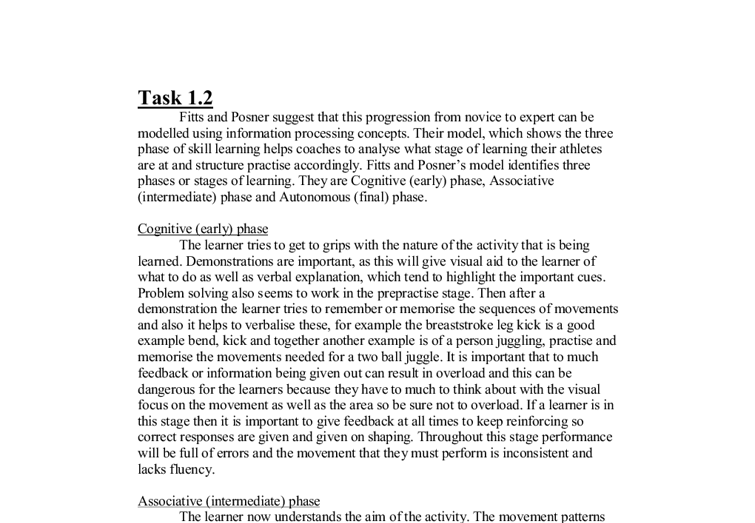 The performer who is in this stage should now have well integrated movement patterns and this should become automatic, they can perform the skill without giving any conscious attention to the movement, unless it is required. This will now give him more time to concentrate on the surroundings around him and example of this is a tennis player can use the opponent's wrist and racquet action to judge the type of spin being put on the ball, this would be to difficult for a novice or in this case a cognitive learner as there is too much to think about. In this phase there is a lot less feedback than the other two phases, this is because they should be able to judge what their errors are and how they are performing. Any information feedback can now be very detailed and specific. Practise can be structured to allow performers to progress through the stages, by using Fitts and Posner's learning theory. ...read more. An associative performer will have the basic skills to produce a basketball lay up but this time he will be more aware of what is going on around, this could mean that because he is better with his awareness he doesn't have to look at the ball while bouncing it and instead look up, also the coach will work on his awareness by putting in a passive defender, just make it a little obstacle for the performer which will help in the game situation. The feedback given in this phase can be a little more specific to the task, although the performer has the general basis to the basketball lay up there still will be many errors, but not as much as the cognitive learner. An autonomous performer will be very well adapted to the basketball lay up. The performer will be able to perform the skill without putting any conscious thought into what he is doing, this performer is well developed an able to give his own feedback on how he is performing and the coach if need to give any feedback that the performer cannot spot, can be very detailed and specific. ...read more. Technique is "the building blocks which allow athletes to achieve skilled performance" (Douthwaite, 2000). Techniques are "building blocks" because they need to be practised and mixed with abilities in order to make a skill happen. Techniques are specific to the activity but some people have different techniques within the same skill (i.e. I think not only does this position reflex my personal qualities of leadership and speed; It gives me a good opportunity to control the game and score quite a lot of baskets. This position has a heavy dependency on speed, Lay-ups, Stamina, Muscular Endurance and Explosive strength. Pivots to face basket to threaten the defender. Sport - Basketball Analysis of Core Skill 2: Dribbling / moving with ball with both hands. My Performer: Top level Performer: Right Hand Preparation Feet shoulder width apart, so on balance. Knees slightly bent. Feet shoulder width apart, so on balance. Feedback Definition Example Intrinsic feedback Information received by the athlete as a direct result of producing a movement through the kinaesthetic senses - feelings from muscles, joints and balance. After a golf shot a performer will feel their hands tingle if they hit it poorly. The associative stage is the second stage of learning, and by this stage the learners have learnt the basic skills but are now trying to practise the skill they learnt whilst in the cognitive stage. Movements begin to look correct, and the more practises that occurs the better they are able to perform them. Simplistic general feedback must be given to the performer so as not to overload them with technical terminology that they wouldn't be able to implement. 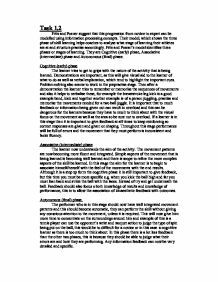 The cognative phase has also been identified by (Martenuik, 1976) as the third level of motor control which has a closed loop element with proprioceptive awareness.